‘What I Ate’ is a series of posts for so-easy-this-doesn’t-need-a-recipe but I’m sharing with you for the idea or inspiration. 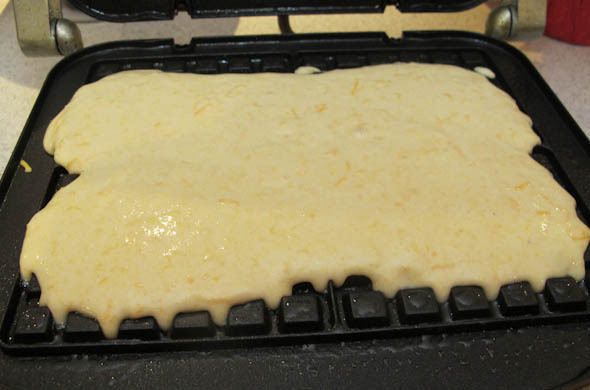 Awhile back I was wanting to make something crazy in the waffle iron. There’s a restaurant I heard about in Syracuse, New York, called Funk ‘n Waffles, that puts all sorts of cra-zy things onto waffle irons. I loved the crispification it sounded like would come from cooking on a waffle iron. 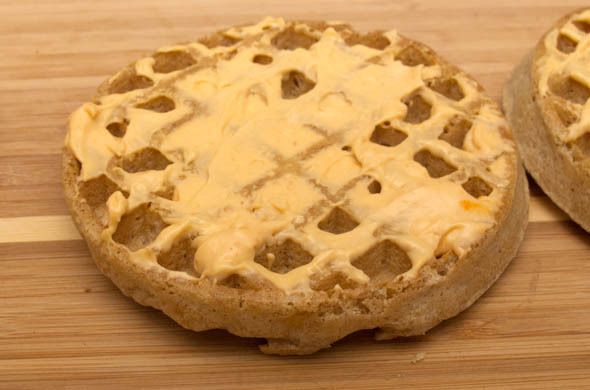 I literally had “cook something weird as a waffle” on my ideas of foods to blog. I used a cornbread mix with cheddar as the base topped with chili. I tried a bacon hashbrown thing that failed miserably. It stuck and never crisped so I ended up tossing it into a frying pan to salvage it. I didn’t end up blogging it because I felt defeated, and tired, and pregnantly-hungry, and I blame my waffle iron. My waffle iron is really some plates that insert into my panini press/griddle. I loooove that they aren’t all separate appliances (since I make waffles mayyybe once a year) but it means that the nooks are pretty shallow…1/3 the depth of a Belgian waffle iron. That’s probably the ticket to more surface area for cooking crazy things. This time I stuck closer to waffle batter and made cheddar cornbread waffles for some nooks the leftover chili could rest it. Such a winner. 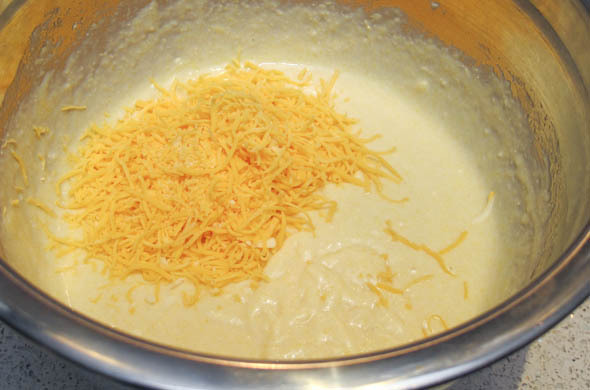 Prepare cornbread according to the mix or according to the cornmeal, then add the cheese & green onions if using them. 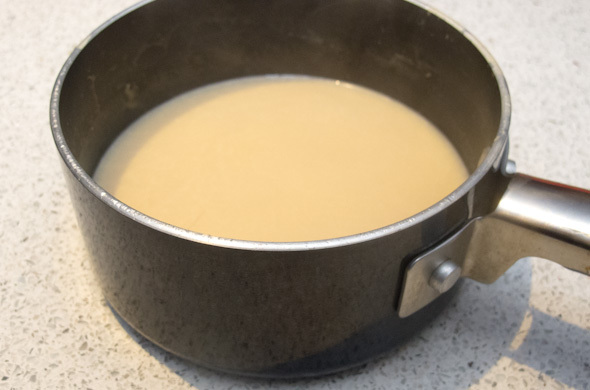 Add in a little extra milk or water to loosen it enough that it drips off the whisk like pancake/waffle batter. 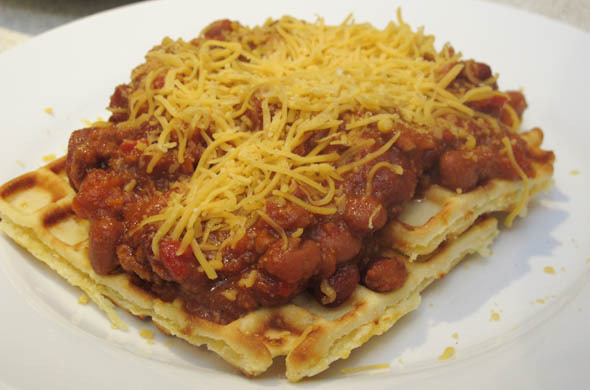 Serve waffles topped with chili and some extra cheese. I liked this platform. 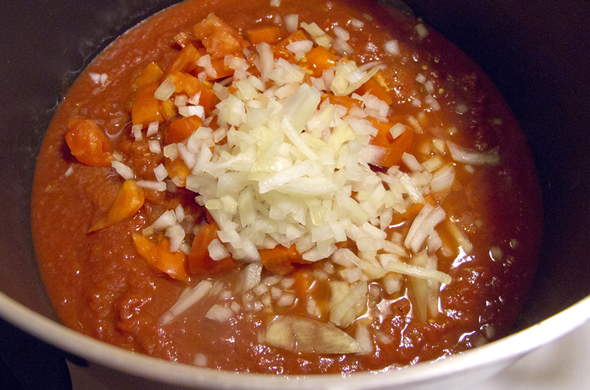 The chili was leftover and would have seemed like a bit less if we just ate it straight up. I probably had a size-able serving for 1 of chili but with the waffles, this fed two of us for dinner. Bam! Leftover magic! It was great to just have to prep the waffles while defrosting & warming the chili. 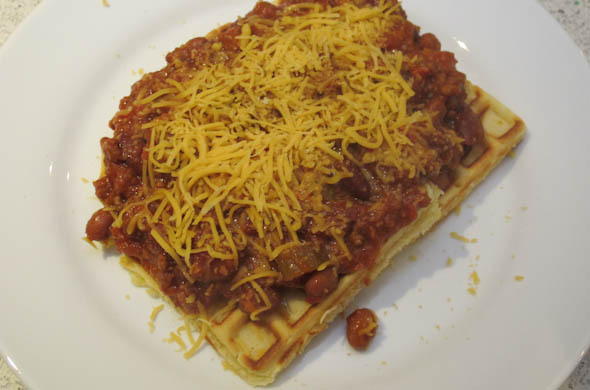 If you’re a big waffle person you could definitely prep the waffles and freeze them when batching up leftover chili. Then they’d just go in the toaster or oven when it was time to serve! I “made” these with pears at the pear-picking-party during the pear cook-off and then of course I’m still using the huge supply of apples we picked. 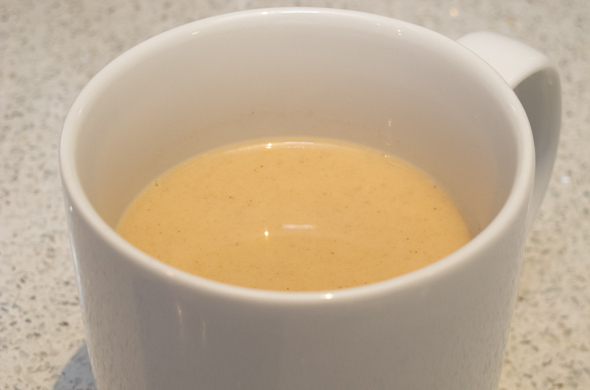 It is a great tweak on a pre-made breakfast option. I love it. Also, work is so nuts right now that I can’t even think beyond about 4 ingredients. I’ll re-surface after Thanksgiving. Is it Black Friday yet? Preheat the oven to 350-degrees. 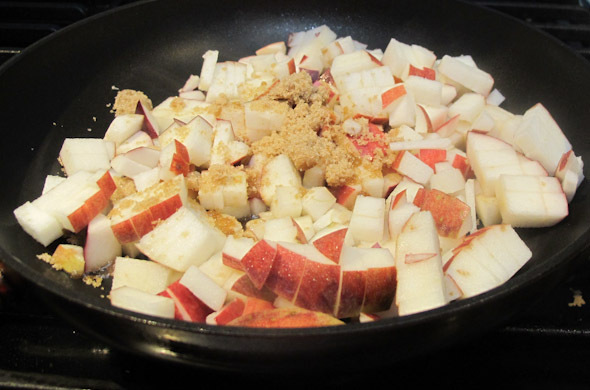 Add the chopped apples to a flat pan with brown sugar over medium heat. Cook 5 minutes until softened, but not mushy. Pop open the cinnamon roll can and place into a sprayed baking dish. Spoon the cooked apple over the top. 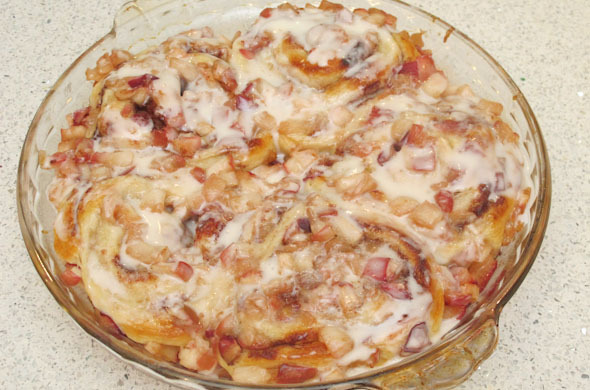 Using a knife, press some apple chunks into the cinnamon roll layers. 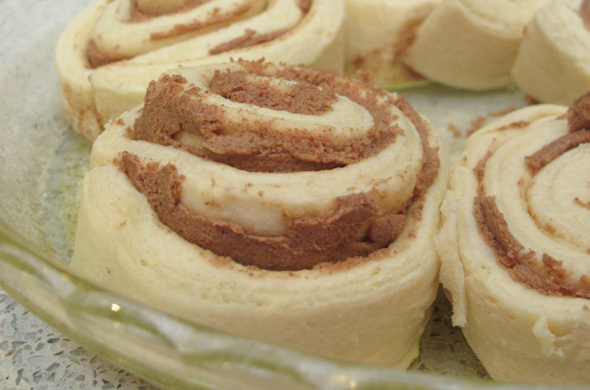 Bake 20 minutes (or according to your cinnamon roll package). Yum. These are fantastic. The apple flavor is so good with the cinnamon in the roll. The frosting is really non-negotiable. Trust me. Don’t skip it. 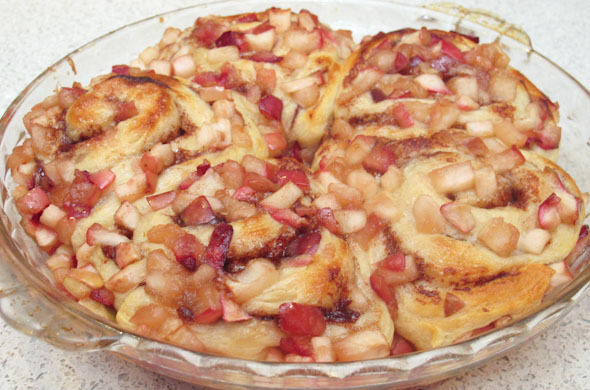 They’re gooey and soft with apple for texture and sticky sweet frosting. You could always make your own cinnamon rolls, but aren’t you too hungry for that in the morning? I know I am! 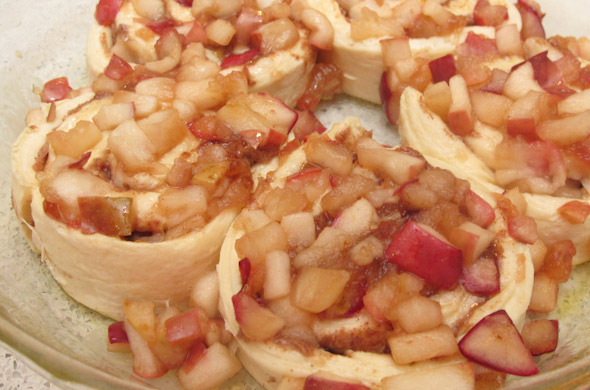 Cook the apples in advance and you’ll be on your way even faster. Make it for Thanksgiving with some dried cranberries getting rehydrated with some cider or orange juice with the apples & brown sugar. Or cook up berries and use that instead of apples! Apple cider is one of my favorite flavors of fall. This fall, as I’m 7 months pregnant, I’ve been heating it and drinking it on the way to work. It helps me pretend I have all the coffee I can drink. Helps. I was digging around to figure out why hot cider at fancy places tastes so different. Then I discovered Betty Crocker had the secret! It is heavy cream! Don’t bail on me, hear me out. 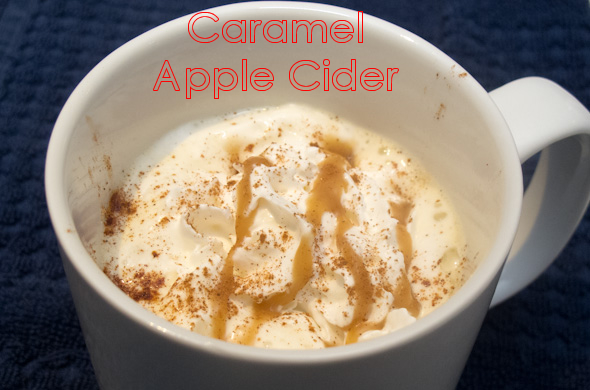 This is amazingly apple and caramel flavored with just a touch of creaminess. 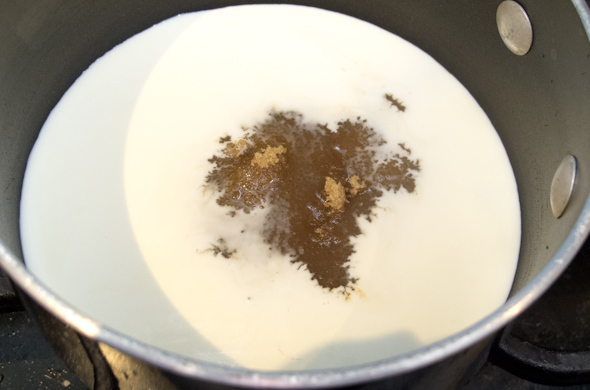 Heat brown sugar and cream until bubbly and dissolved. Add cider, vanilla extract, and cinnamon, cooking until heated through. Optional: top with whipped cream, cinnamon, and caramel ice cream topping while playing some coffee house jams. This is so decadent. I have it for dessert…warmed cider is the morning version. It is super sweet but you definitely taste the caramel and apple. 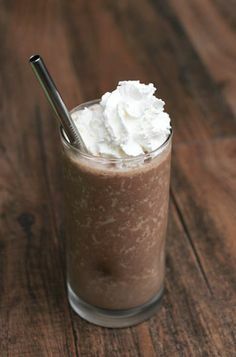 You could always add in a splash of rum, vanilla vodka, whipped cream vodka, or the spiking of your choice. ding ding ding! D is correct, which means each are right. I figure nobody wants to read a post I wasn’t really into writing or editing so I’ve snoozed a bit earlier than usual, passed my glucose/gestational diabetes test! Mr. J and I went to the hospital to meet the maternity/delivery team and learned how much we don’t know yet. Somehow more posts didn’t make it into this week. 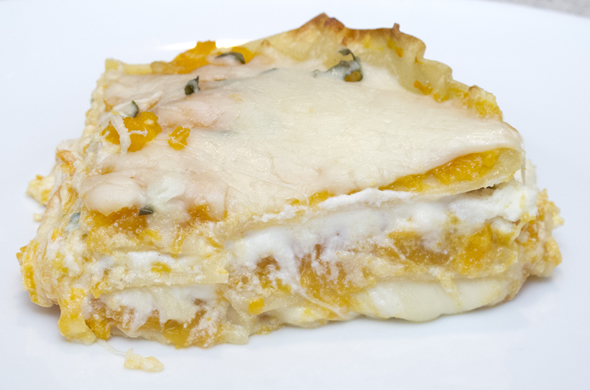 I’ve cooked a bunch this week and last week of oldie but goodies that were freezer friendly so half could be enjoyed now and the other half could emerge during my busy time at work…just before Thanksgiving! Here they are in no particular order if you’re ready for fall/wintry foods or want some freezer prep too! I love this one. 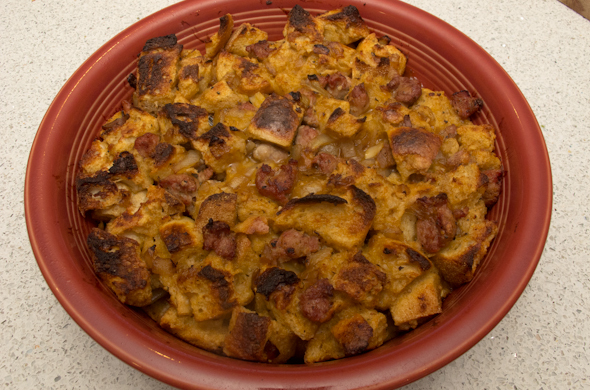 It is so good and perfectly divides into 2 baking dishes…one for now, one for later. This is a great main dish, or a side. I added shallots and pears and we devoured the “now” portion. 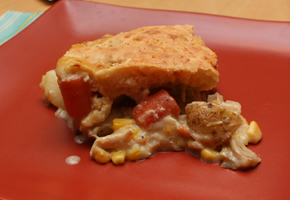 I make the filling and add the topping when round 2 comes up. I literally filled the crockpot for 5 people. Needless to say there were leftovers so we ate some a few more times, and froze the rest. 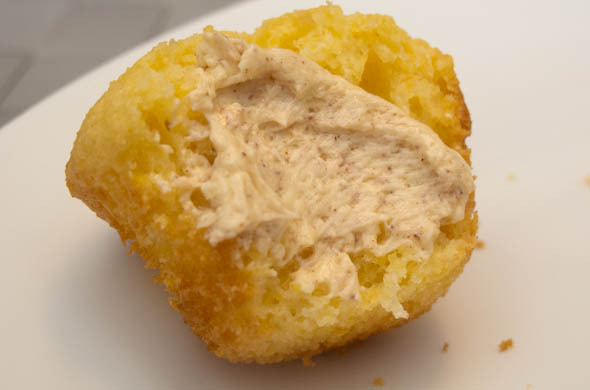 I whipped up this jazzed up butter after making corn bread muffins. I was thinking these flavors would be really good in corn bread, but since I’m not much of a baker I decided not to mess with the muffins. Messing with the butter seemed like like a safer option. Don’t ya think. 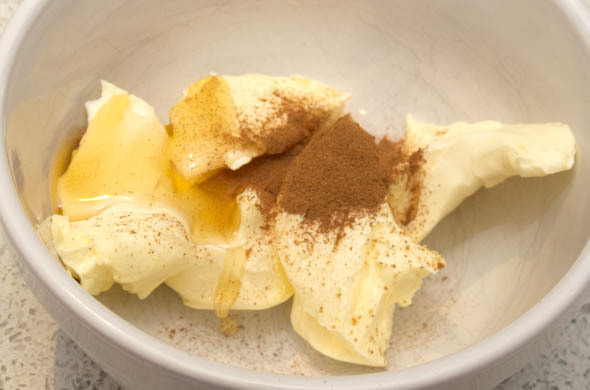 Mix room temperature butter, honey, and cinnamon together. Chill until serving to solidify until serving. 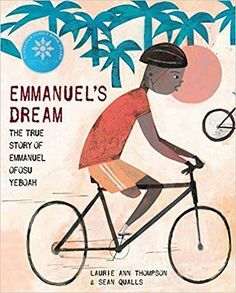 I loved this. It tasted like fall! I had tons leftover and it was so perfect on toast. These cool mornings and the honey and cinnamon flavors made me so happy. I should junk up the butter more often! 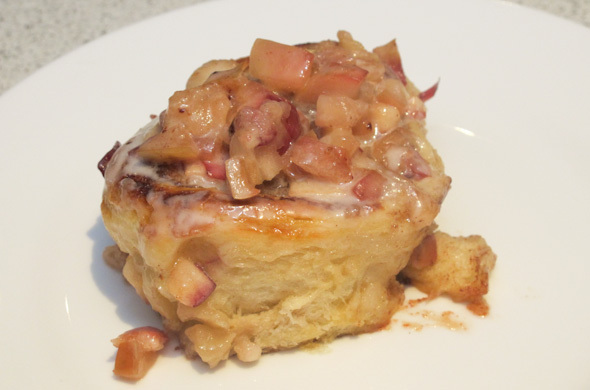 This one wasn’t beautiful but the berry ones on french toast….come on. So pretty! I jazzed up some dogs just as summer was “ending” though there’s plenty of grilling season left. I should totally have done this combo sooner. Grilled dogs with pineapple & teriyaki sauce. I just want crazy toppings on everything right now. 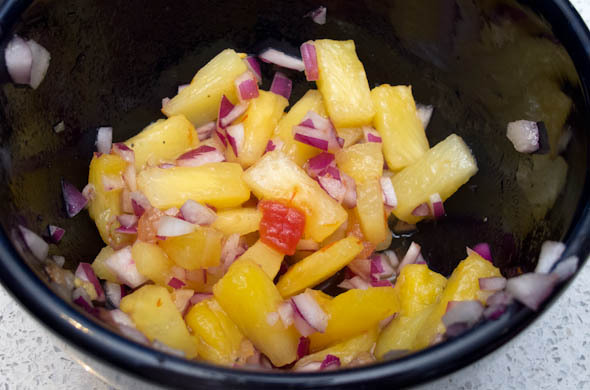 I mixed up chopped red onion, pineapple, and just a touch of salsa. 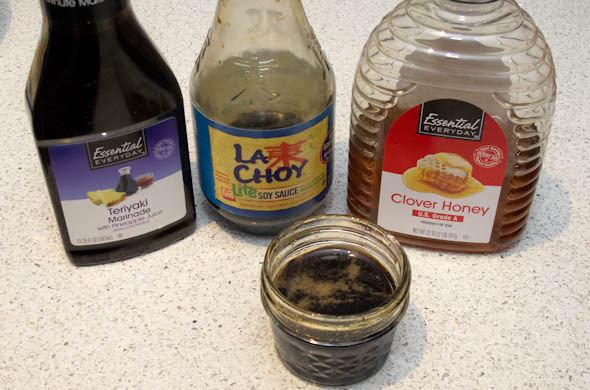 Then I mixed honey, teriyaki marinade, and soy sauce. I eyeballed it, and went heavier on the honey than anything else. 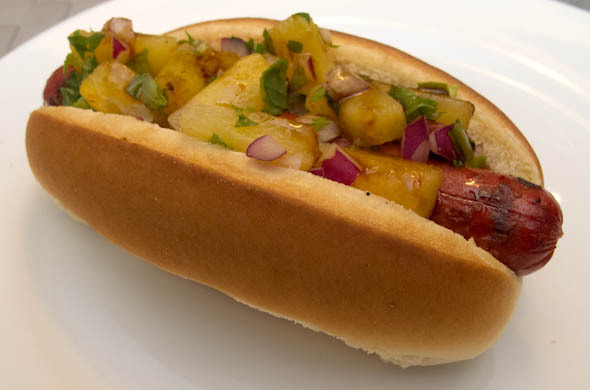 The tang of the teriyaki, the sweet pineapple, and crunch of the red onion went perfectly with the dog and soft roll. There are so many topping options besides the regular mustard/relish. These were fun. I love a good theme. Flying on Jess Fuel made some Banh Mi Hot Dogs that looked incredible. A nacho-y one would be fun or I did one with avocado, leftover corn cut off the cob, and ranch for a Californian Dog. Food themes are the only time old stereotypes are permissible, right? 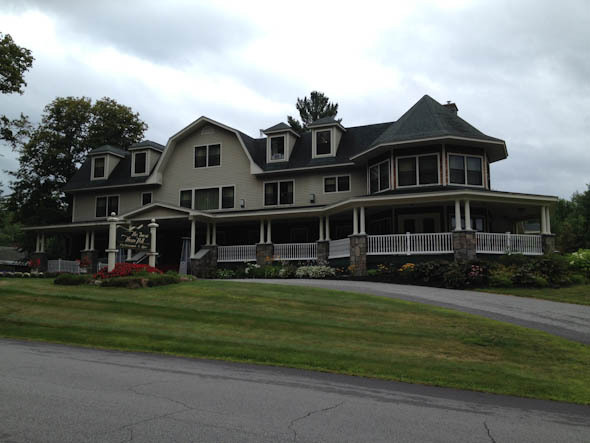 Mr. J’s bday present was a little getaway to New Hampshire. I’m so thankful not to travel for work anymore and I’m loving being home all summer. It is amazing. 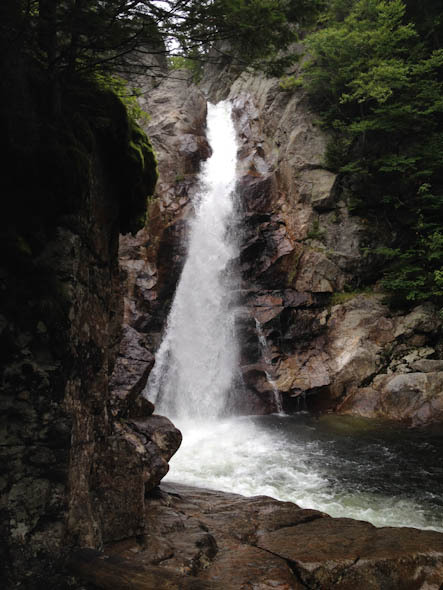 Being home has actually involved a few trips to Maine, a few days to Cape Cod, and possibly one more jaunt. I wasn’t sure NH was going to fit in. I bought it for Mr. J’s bday in June then didn’t schedule it for-ev-er. We explored nature and ate lots of good stuff. 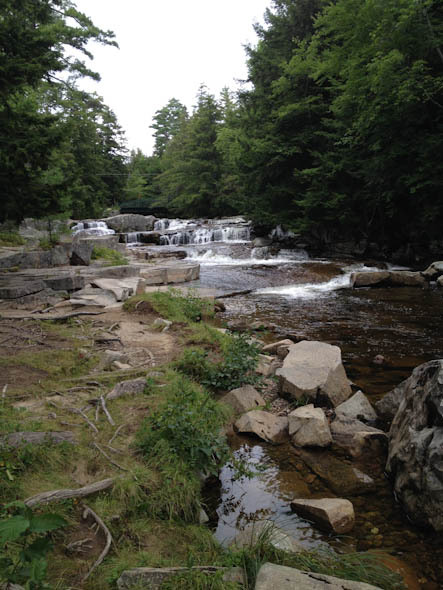 We stayed in Jackson, NH which is a little town near North Conway, but without the insane traffic. The inn was cute and had a phenomenal porch. On our way up to New Hampsire we figured we stop somewhere for lunch and it just so happened we’d pass one of the many locations of Portland Pie Company. My favorite pizza! Though, their service is pretty terrible, all the time the pizza was really good. 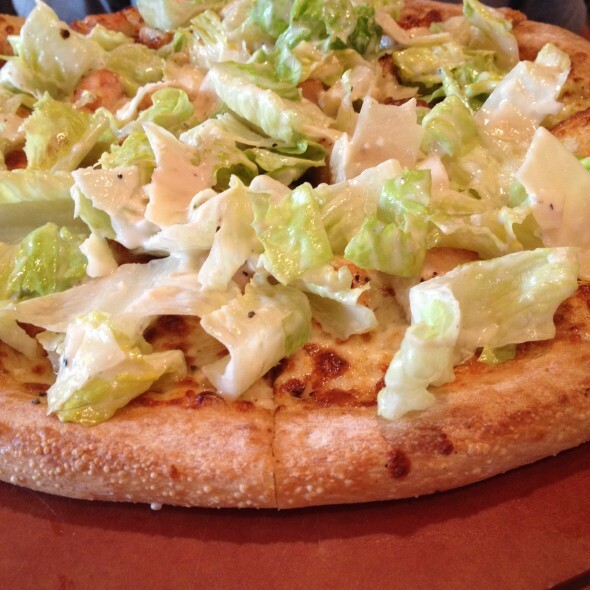 We got one of their seasonal pies: chicken caesar salad pizza! After checking in and poking around the inn, we explored the town and the area. We got dinner at the Red Fox Pub. We were really tired by then and were very hungry. 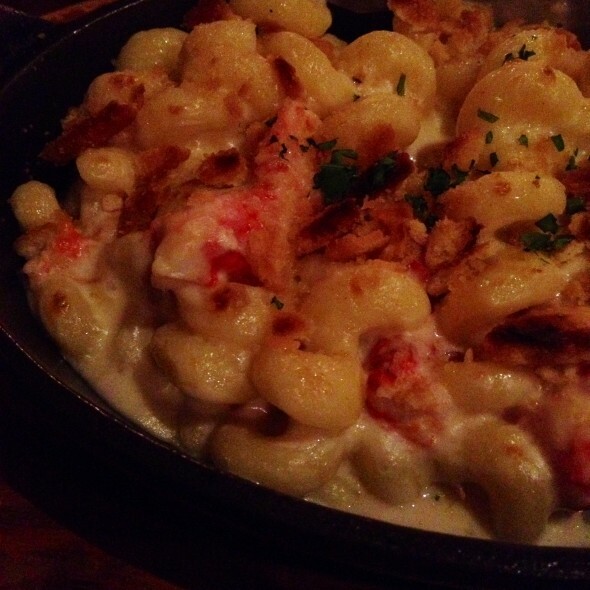 I got lobster mac & cheese. There was an impressive amount of lobster and I couldn’t come close to finishing it! Mr. J had wood grilled meatloaf so he was as happy as can be. That was only Friday! Saturday we enjoyed breakfast on the porch of the inn and then checked out a tented art show, then we did a mini hike to some falls. It was breathtaking…also getting back up to the parking left me winded, so literally breathtaking. Mr. J adventured to some insane spots all in the name of photography. Luckily he didn’t end up in the drink! We also popped into the LL Bean Outlet there where we found upright adirondack chairs. On sale. 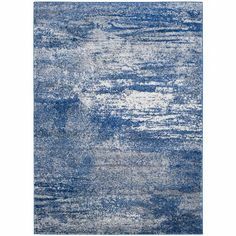 With an extra 30% off. Also using several LL Bean credits from our credit card. Scoooooore! We got two for less than the price of 1 normally. It was so meant to be! We didn’t have the pups so we got our new chairs into the car all assembled and never looked back. Just wait till I show you our beautiful yard projects with these snazzy new chairs by the firepit. Dinner was part of our package to each have 3 courses at the inn. I started with clam chowder since it was 60-something degrees that day! 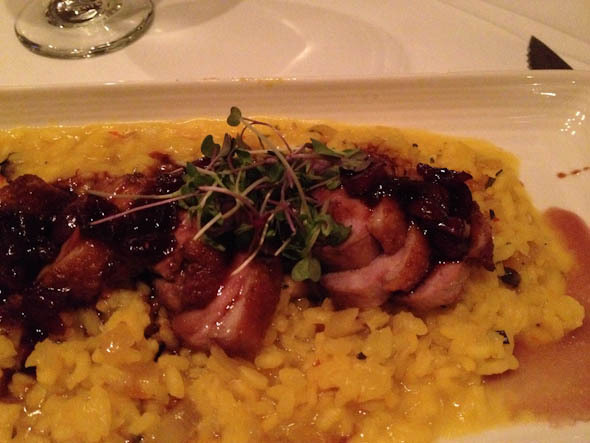 For my entree, I chose duck over mushroom risotto with a chambord glaze. The duck and sauce were so good. The glaze was pretty sweet to it paired nicely with the salty risotto. I didn’t exactly have room for dessert, but when on vacay! 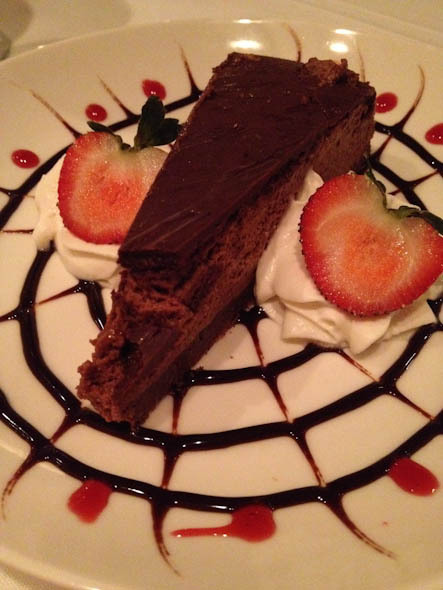 I had a chocolate hazelnut tart that was just amazing. Sunday morning we decided to venture out for bagels. We had passed a little bagel joint the day before with a sign boasting home of the boissant croissant/bagel hybrid. 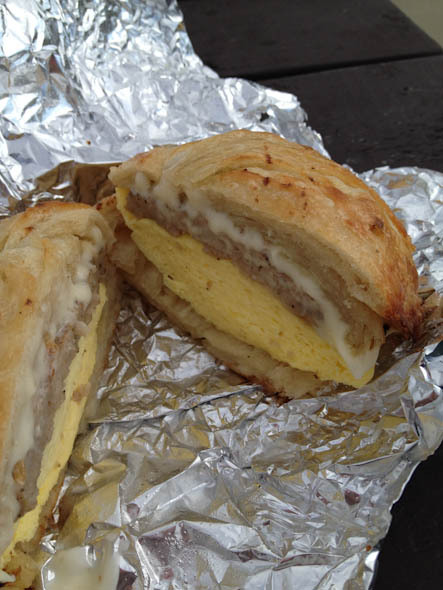 Hands down, best breakfast sandwich I’ve ever had. I wish I brought boissants home. I was thinking it would be more like a bagel or more like a croissant, but I love both so I figured I’d bet set. It was such a wonderful mix of the two. It was a nice little getaway. We wished it was warm enough to swim since the pool at the inn was cute but I’m still thankful for cool days. They were nice for walking around a lot. I hadn’t known if there’d be a lot for us to see/do but we had a great time wandering and not being at full pace. 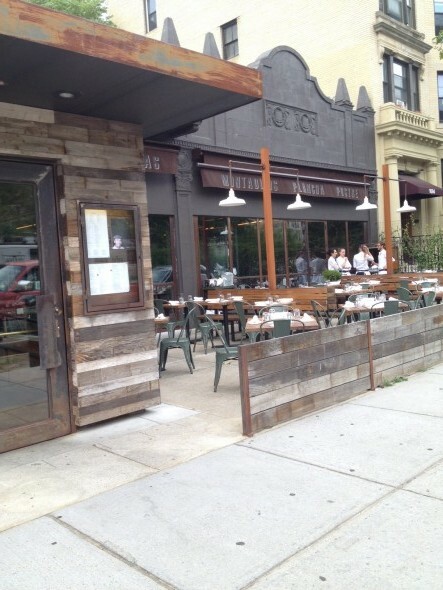 Washington Square was not the same culinary scene when I lived around there. It makes me feel old but when meeting Ms. L for Tapas at Barcelona Wine Bar and we marveled at how many cool restaurants are there now. We decided on Tapas to hear about her trip to Spain. It was crazy hot so we ate inside. The patio is lovely though. Tapas is such a good summer meal to dabble in flavors and textures that appeal at the moment. I loved the menu. There were a ton of choices and we did a fantastic job choosing…I have to say. I was glad some were really sizable. I am happy to say we left feeling full without breaking the bank. 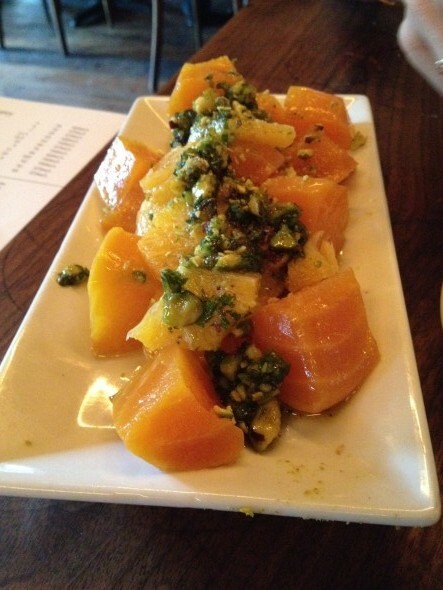 Golden Beets with Pistachio Pesto & Orange – This might have been my favorite dish. The beets were so good and the pistachio pesto was fantastic. 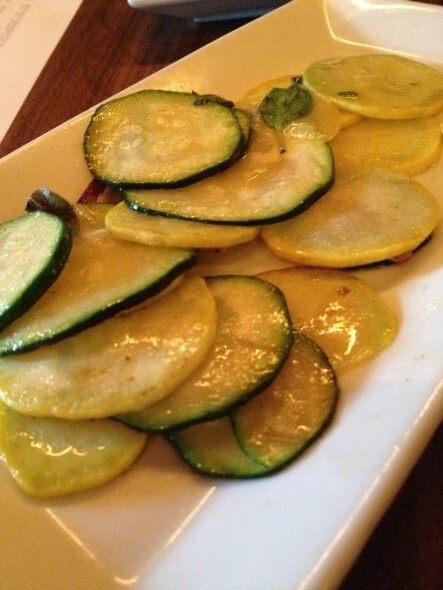 Zucchini and summer squash- these were from a local farm. They were lightly cooked and a good compliment to everything else we had. 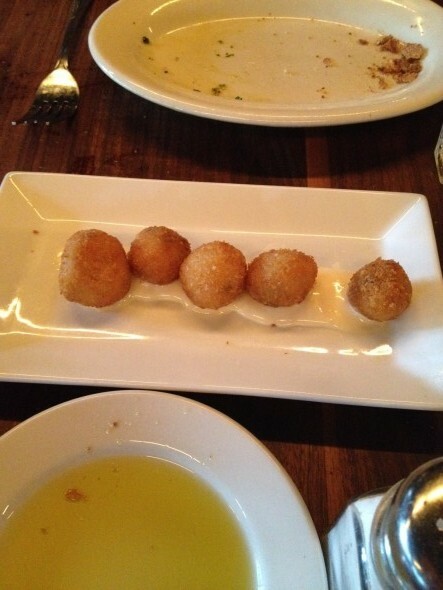 Jamon and Chicken Croquettes – these were perfectly crispy with a light aoli underneath. They were perfectly pop-able. If they were any smaller I might have devoured them without enough attention. 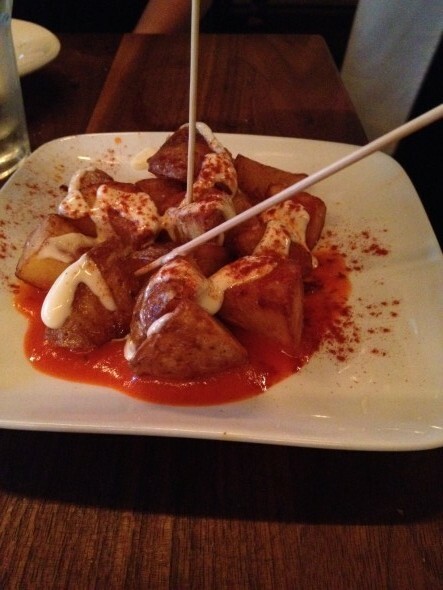 Patatas Bravas Salsa Brava, Garlic Aioli – these arrived hot from the kitchen. They were crispy and had great tomato flavor. We weren’t sure if this was going to be too spicy but it was perfect. 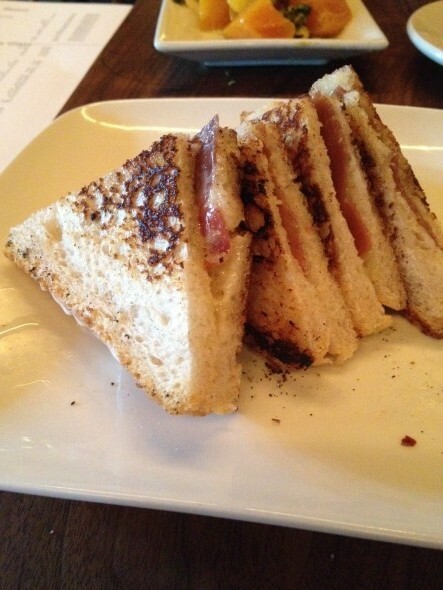 Truffled “Bikini“ Grilled Cheese, Jamon Serrano – mini grilled ham & cheese with truffle oil. Yes. Please. 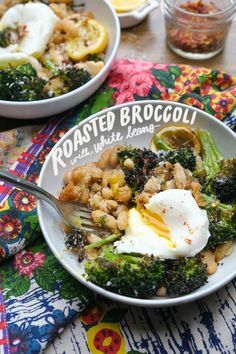 These were so good and a great balance with the veggies we had. Brookline has some fantastic restaurants that I love (like Fireplace, Regal Beagle, Orinoco, La Morra, Publick House, Matt Murphy’s and of course Brookline Spa). And a bunch more new ones I still have to try (like Ribelle, Fairstead Kitchen, The Abbey). Any other Brookline spots I’m missing out on? It has now been a long time since I worked in Brookline Village and lived in Cleveland Circle area! Were you missing the #whatiate series from Fridays? 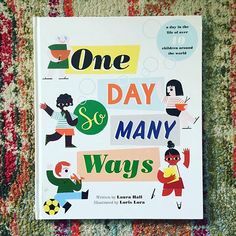 I have a few I need to do now that I’ve regained momentum so stay tuned for more! We’ve had some hot days, and I’m so thankful for everyday that isn’t a thousand degrees or humid. Some nights dinner’s theme is “how to cook without turning on the oven”. That’s where this came in. I had an event at work and was lucky enough to take home some of this salsa. The food demo encouraged cooks to use these raw salsas over fish, poultry, and beef. Done! Chop & combine everything except the parsley. Let sit 30 minutes in the refrigerator. Add parsley just before serving. I marinated & grilled some chicken and served it all over brown rice. Dinner is done. 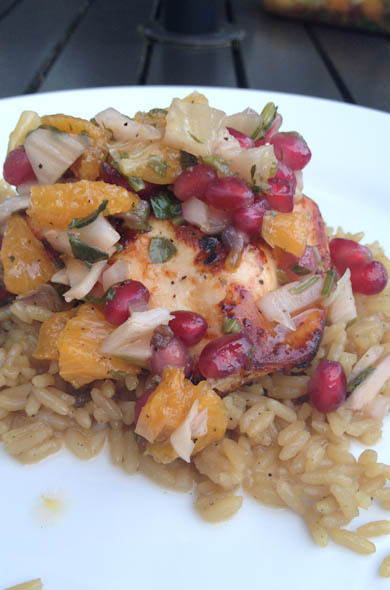 I love the crunch and tartness of the pomegranate seeds with the oranges. This is great as a salsa to dip with or as a sauce. I know I get stuck thinking summer sauces are BBQ or teriyaki but a cool raw one is really fun. I’ll have to mess around with some other salsa ingredients! 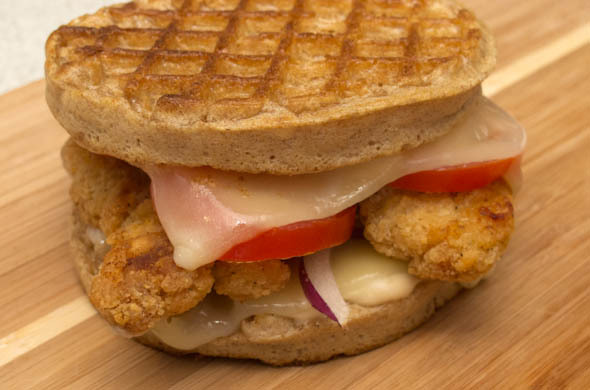 Chicken and waffles are such a fun dinner and I was thinking it could become a panini using the waffles for the bread. These are easily adaptable. I used white cheddar, tomatoes, onions, and some buffalo aoli. Bake the chicken until cooked through. Toast the waffles until defrosted and lightly toasted. 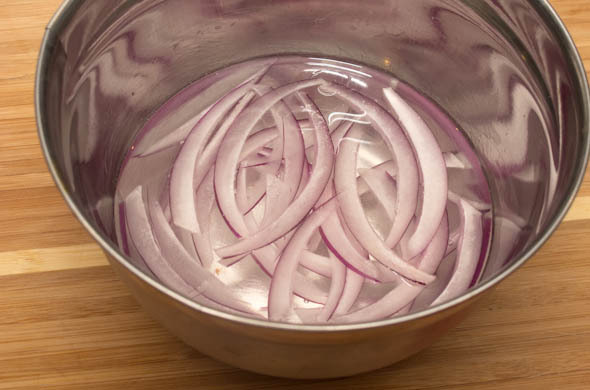 Slice the onions and add to cold water. 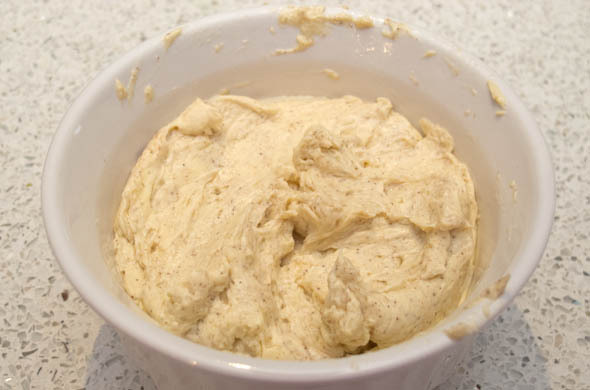 Whisk together the buffalo aoli, or add your fav spread like honey mustard, ranch, or a drizzle of maple syrup. Keep the oven warm after the chicken is cooked. 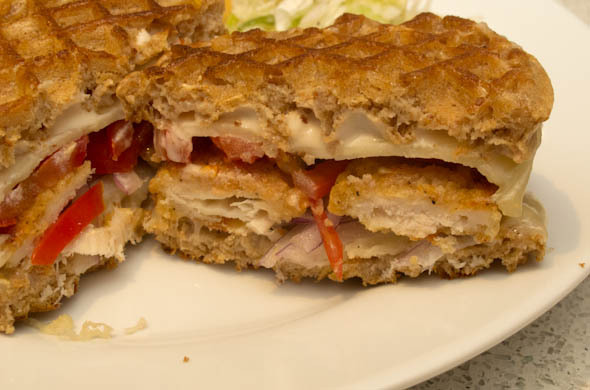 Assemble the sandwiches with waffles, the spread, chicken, sliced cheddar, sliced tomato, and sliced onion. Put them back into the oven, flipping once, until the cheese melts. This was so fun. The nutty waffle was perfect with a little spice. Arugula would be good in here too. 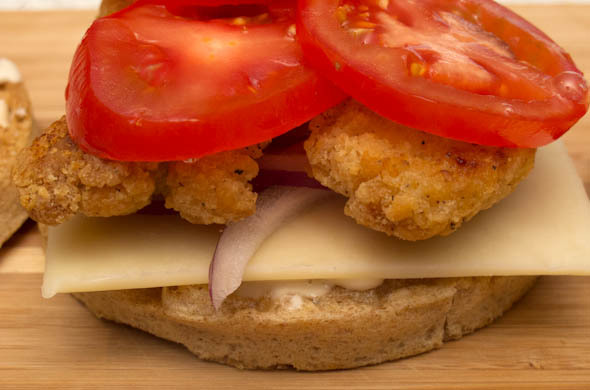 The onion bath keeps them from overpowering the sandwich, with just a subtle onion flavor.